Stir-fry is the ultimate easy-to-prepare dinner–barely a step above sandwiches in terms of required cooking skill. Roughly chop all your ingredients. Start by sweating the onions and other veggies, stir in garlic until fragrant, and add protein until cooked through. Of course, you can also upgrade your stir-fry from there with noodles, rice, quinoa, or a super savory sauce. A few of these stir-fry recipes contain ten ingredients or less, but never be afraid to make substitutions in a pinch. You can use the proteins, produce, and seasonings you have on hand to tweak these flavor profiles a tiny bit in favor of convenience. Want to take your wok beyond chicken and bok choy? 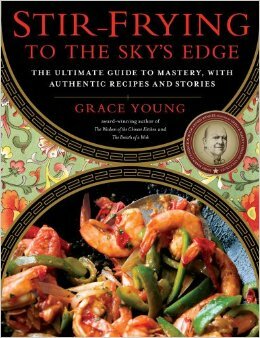 Stir-Frying to the Sky’s Edge: The Ultimate Guide to Mastery by Grace Young has recipes that explore the tastes of Asia, ranging from Shanghai and Hong Kong to Singapore and Malaysia. 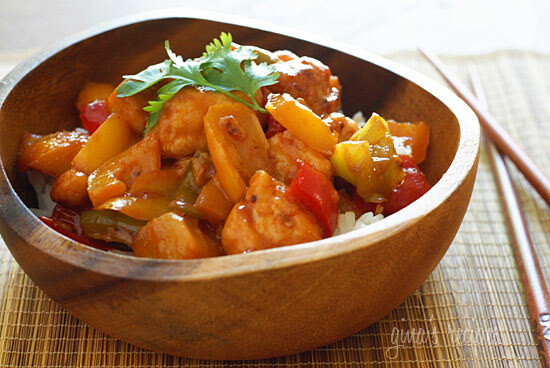 The guide includes global phenoms like Kung Pao Chicken and Chicken Lo Mein, but you’ll also be surprised by fusion dishes like Chinese Trinidadian Stir-Fried Shrimp with Rum and Chinese-American Shrimp with Lobster Sauce. The book is also interspersed with stories to go with these authentic and creative recipes, one of many reasons why it won the 2011 James Beard Foundation Award for International Cooking. 1. In a large bowl, make the marinade by mixing the cornstarch, 1 tsp. Shao Hsing rice wine, soy sauce, ½ teaspoon salt, and 1 teaspoon peanut oil. Add the sliced chicken, and toss to coat. Set aside. 2. In a separate bowl, mash the black beans, garlic, ginger, and dark soy sauce together with a fork. 3. Add a tablespoon of peanut oil to a wok, and when heated, add the onions with the red pepper flakes. After the onions begin to turn translucent, spread them evenly along the bottom of the pan, and add the marinated chicken over the top. Cook for a minute, and then stir. 4. When the chicken is nearly browned, add the carrots and the black bean mixture. Cook for about a minute, or until fragrant. 5. Measure out the chicken broth, mixing in the remaining tablespoon of rice wine. Pour over all the ingredients in the wok, and season with ¼ teaspoon salt. Continue stir-frying until all ingredients are thoroughly cooked and the sauce thickens a bit, about 2 minutes. 6. Serve the chicken stir-fry with the scallions as garnish. 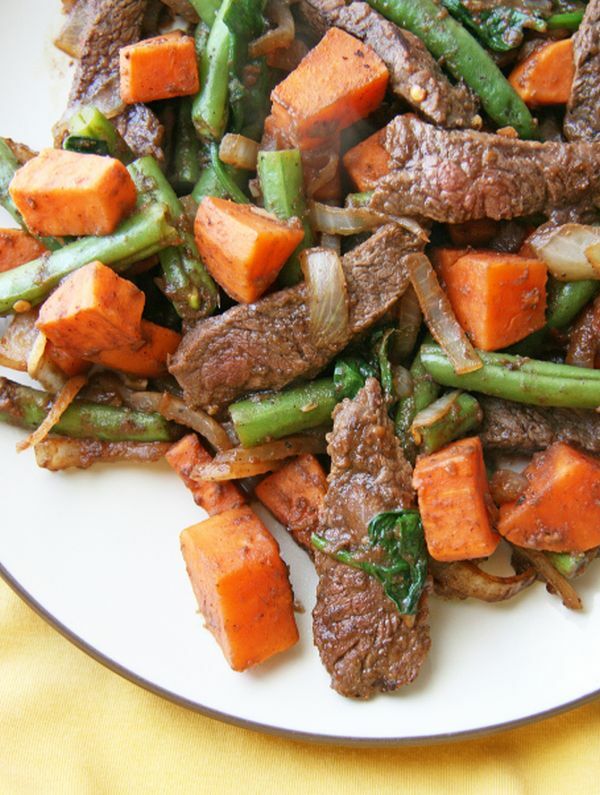 If you’re looking for a new take on beef stir-fry, try integrating a vegetable you wouldn’t normally associate with the dish, like sweet potatoes. First, to add a touch of sweetness and spice, the beef is cooked with applesauce, cinnamon, cloves, ginger, and garlic. Then the seasoned meat is tossed with the veggies, and finally a handful of spinach is added to wilt. 1. In a medium bowl, mix together the applesauce, cinnamon, cloves, soy sauce, red pepper flakes, garlic, and ginger. Add the beef, and toss to combine. Set aside to marinate. 2. Place a medium pot on the stove filled with 2 ½ cups water. Bring to a boil, and add the sweet potato chunks. Cook until slightly soft but still firm, about 5–7 minutes. Remove sweet potato pieces with a strainer or slotted spoon; do not drain the water. 3. Return water to a boil. Add green beans to boil for 4 minutes, until soft but firm. Drain and set aside with cooked potato. 4. In a large wok or skillet, add coconut oil over high heat. Once hot, add the beef mixture and sliced onion, tossing quickly until done, about 3 minutes. Then toss in the spinach, sweet potatoes, and green beans. Cook for 1–2 more minutes, and serve. 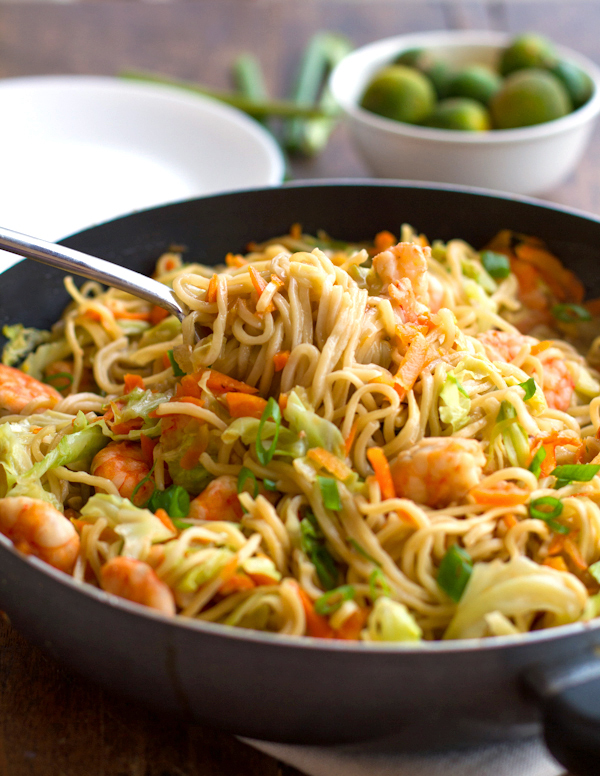 This seafood stir-fry uses Filipino noodles as a base. With such simple ingredients, it’s a great way to ease into Eastern cuisine. Take a trip to your local Asian store to pick up a package of pancit Canton noodles, which will look like a block of ramen but thicker. While you’re there, be sure to grab some fish sauce – it’ll come in handy for adding depth of flavor to sauces and soups too. 1. Heat a tablespoon of oil in a large skillet or wok. Add the garlic and onion to stir-fry until soft, about 3 minutes. Add shrimp and cook, stirring frequently, until no longer translucent, about 3–5 minutes. Remove from heat, and set aside. 2. Add another tablespoon of oil to the pan, and stir-fry the vegetables until tender-crisp. After about 5 minutes, remove from heat, and set aside. 3. In a large pot, bring the chicken stock, soy sauce, and fish sauce to a boil. Add the pancit noodles, and boil until the noodles are soft, about 5 minutes. Add the shrimp and vegetables to the pot, and stir to combine. 4. Add the remaining tablespoon of oil to a large skillet, and add the contents to the pot. Stir-fry the mixture for about 10 minutes. When most of the liquid has been absorbed, remove from heat, and stir in the calamansi juice. Top with sliced green onions. The beauty to most stir-fry dinners is they only dirty one pan. But this incredible low-fat dish – a major upgrade on orange chicken with succulent seafood – is worth the extra steps. First, you’ll have to cook the noodles, which is a greater concern for time than effort. Then, it’ll take a bit to marinate and bake the scallops. But once you combine all the components and take that first bite, you’ll realize why this gourmet stir-fry is worth the sink full of dishes. 1. Boil a pot of water, and cook the soba noodles according to package directions. Rinse in cold water, drain, and set aside. 2. In a bowl, mix together miso, orange juice, mirin, 1 teaspoon sesame oil, ginger, garlic, and sambal olek. Add scallops, and toss gently to coat. Cover, and leave in the fridge to marinate for 15 – 30 minutes. 3. Line a baking sheet with foil, and lightly coat with oil. Remove scallops from marinade using slotted spoon (save the marinade), and place on the baking sheet. Flip scallops so each side has a little oil on it. Broil 7–9 minutes until cooked through. 4. Heat oil in a wok or large skillet. Add the white parts of the scallions, and stir-fry for a minute. Add the snow peas, carrots, bok choy, and mushrooms. After another minute, add the reserved marinade, a teaspoon of sesame oil, soy sauce, and remaining scallions. Cook for another minute. Add cooked soba noodles, and toss to coat and heat through. 5. 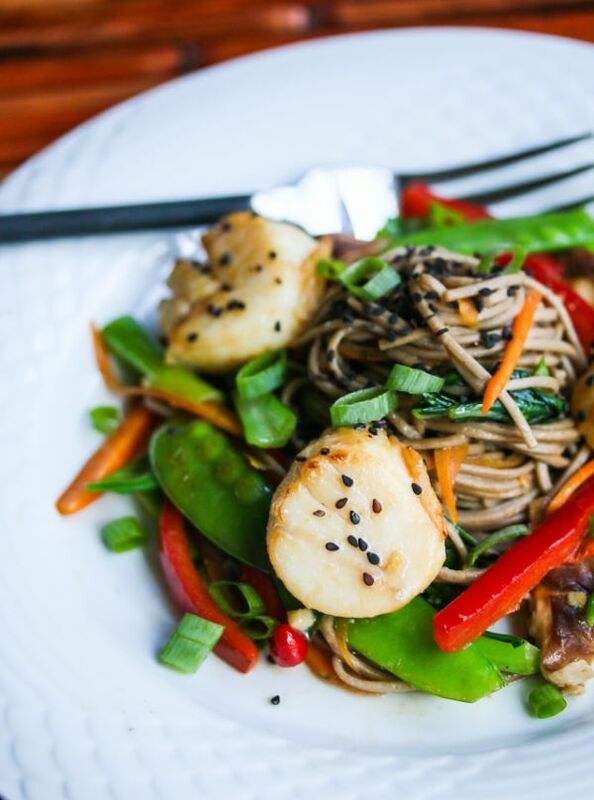 Plate soba noodles, and arrange scallops on top. Sprinkle with black sesame seeds. This pork stir-fry is a great way to eat seasonal even when it’s cold outside. 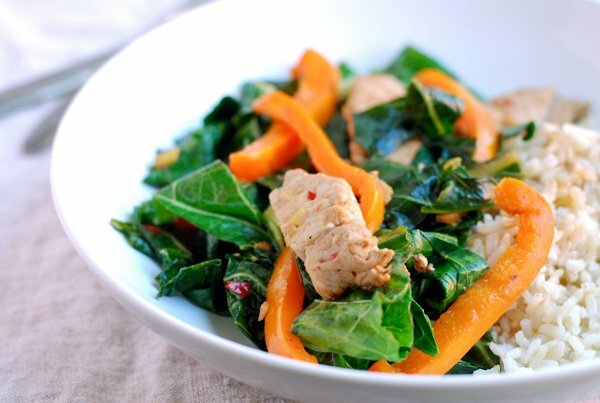 With hearty collard greens, fresh bell pepper, and a succulent pork loin, this dinner is as filling as it is time-saving. Altogether, it should take no more than 20 minutes to prep and cook this simple stir-fry. And if you can get the pork loin on sale, it’s also an economical at about $5 a plate. 1. Cut pork loin and collard greens into thin strips. 2. Toast sesame seeds in a dry pan on low heat until medium-brown. Set aside. 3. Add oil to a wok or high-sided frying pan, and add half the garlic. Fry for 15 seconds, and toss in the collard greens. Stir-fry on high heat until tender, about 3 minutes. Set aside. 4. Stir-fry the bell pepper in the wok until soft, about 2 minutes. Set aside. 5. Add the remaining garlic to the pan, followed 15 seconds later by the ginger and sliced pork. Add soy sauce, stir for a minute, and then add the green and peppers. Turn off the heat. 6. Serve sprinkled with sesame seeds and garnished with fresh cilantro. 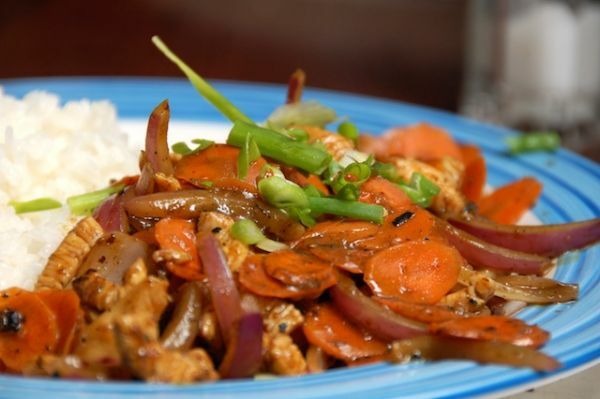 If you’re looking for a tasty Thai stir-fry, look no further than everyone’s favorite take-out: Pad Thai. 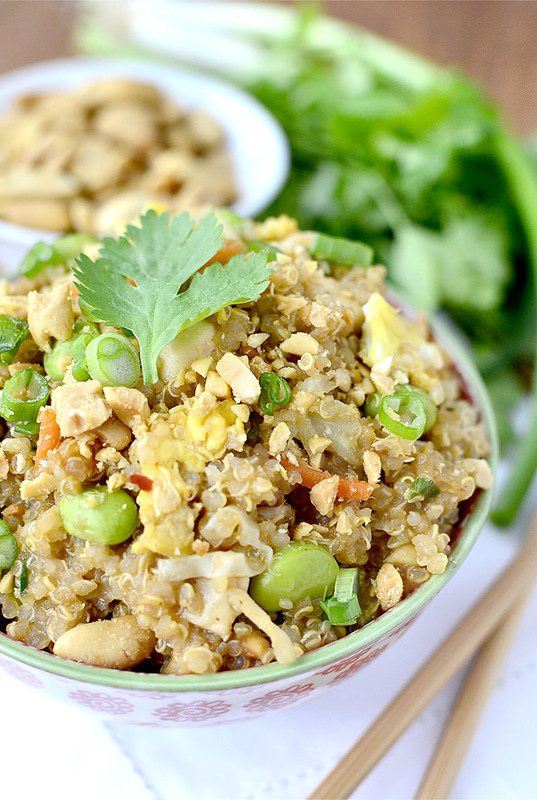 But this one has been upgraded with quinoa, which has twice the protein of rice plus 5 grams of fiber per cup. Use frozen edamame and pre-cooked quinoa to save time. 1. Bring chicken broth to a boil in a saucepan, and add the rinsed quinoa. Place a lid on the pot and lower the heat to cook for about 15 minutes, until quinoa has absorbed the liquid. Fluff with a fork, and then set aside. 2. In a small microwave-safe bowl, stir together tamari/soy sauce, rice vinegar, water, sugar, peanut butter, and chili garlic sauce. Microwave for 20 seconds, stir until smooth, and set aside. 3. In a separate small bowl, whisk together the egg and sesame oil. Set aside. 4. Heat a teaspoon of peanut oil in a wok or large skillet over high heat. Season chicken with salt and pepper, and then add it to the wok to stir fry until no longer pink, about 5–7 minutes. Transfer to a plate, and set aside. 5. Heat the remaining teaspoon of peanut oil in the wok, and add the coleslaw mix, frozen edamame, and green onions. Stir fry until tender, about 2–3 minutes, and then push the veggies to the outside of the wok. In the cleared space in the center, add the whisked egg. Stir fry until soft scrambled. 6. 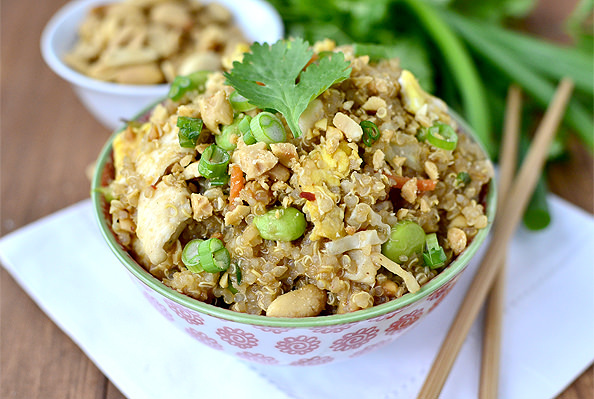 Add cooked chicken, quinoa, sauce, and half the chopped peanuts to the wok. Toss to combine. Serve with the remaining chopped peanuts sprinkled on top. This is another quick stir-fry that can be made with frozen produce, like a mix of sliced bell peppers and some pineapple chunks. Other than that, you’ll just need some basic seasonings, your hot sauce of choice, and diced chicken breast. Dinner will be ready in a flash! 1. Lightly coat a skillet with peanut oil, and set over medium-high heat until very hot. 2. Add the chicken, salt, pepper, and oregano. Stir-fry until the chicken is browned on all sides. 3. Stir in the hot sauce and frozen pineapple tidbits. Cover with a lid, and let cook for about 5 minutes. 4. Add the pepper slices to the pan, stir, and cover to cook for another 5 minutes. 5. Turn off the heat, remove the lid, and let cool for 2 minutes. Enjoy! What did you think of these healthy stir-fry recipes? Have anything else to share? Let me know in the comments below!